A woman with a neuro-muscular condition has described being chased in a car park and told she was abusing the blue badge disabled parking scheme. Sara Flay, from Neath, needs support from ankle and leg braces but her disability is not immediately obvious. “The incidences were so negative at one point, that I stopped reapplying for my blue badge,” she said. Blue badges are parking permits allowing drivers or passengers with mobility issues to park nearer to where they are going – usually in specially marked disabled parking bays. The criteria for getting a blue badge includes receiving disability benefit, having severe sight impairment or being assessed as having seriously limited mobility. The scheme has recently been extended to include people unable to plan or follow a journey without help from someone else, such as those with learning disabilities or dementia. Ms Flay has needed support from ankle braces for most of her life and recently leg braces. She told BBC Sunday Politics Wales her disability was not necessarily obvious, and she gets stares from people on a regular basis when using her badge. “I’ve had one incidence of being chased across a car park and shouted at and told I was abusing the system, because I wasn’t actually disabled, even though I had a blue badge on my car,” she said. “That made me really anxious and stressed. Ms Flay has since started using her badge again. Disability Wales chief executive Rhian Davies said that despite the eligibility being widened, some people assume you only get a blue badge if you are unable to walk. “We are hearing about disputes in places like supermarket car parks,” she said. 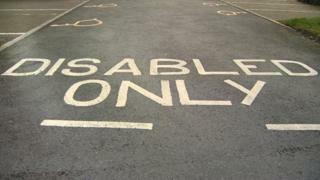 The Welsh Government is responsible for the Blue Badge scheme in Wales, and local councils administer it. Disability Wales said a campaign by the Welsh Government and councils was needed to explain the barriers blue badge holders face on a day-to-day basis. A Welsh Government spokesperson said: “We will continue to work with disabled people, and groups who represent the interests of disabled people, on these issues through our new Framework ‘Action on Disability: the Right to Independent Living’ and through our Disability Equality Forum and Hate Crime Criminal Justice Board.